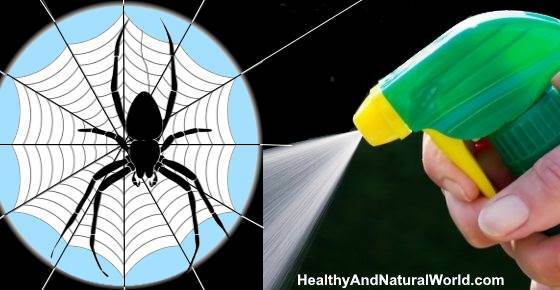 Natural spider repelling sprays are much safer and environmentally-friendly to use around the home than chemicals and harmful insecticides. Making sprays from essential oils like peppermint oil, citronella oil, and tea tree oil can help get rid of spiders from your home naturally. As well as using sprays to get rid of these annoying pests, you need to eliminate food sources and seal up any small cracks where spiders can enter the home. Spiders often come inside homes in the fall when the weather turns cooler. However, they also enter houses in the summer when windows and doors are left open. Maybe the first sign that you have spiders in your home is cobwebs hanging from the ceilings. You could also find egg sacs in the corners of windows or furniture. In this article, you will find out how to make your own natural sprays to get rid of spiders from your home. You will also learn about other methods to control these creepy crawlies and stop them from becoming a nuisance in your home. Before we look at spraying these arachnid pests with natural insecticides, it’s helpful to know that there are some benefits to having spiders in the home. However, most people want to get rid of spiders from their home as quickly as possible. This is especially true if you have a serious problem of house spiders or you have poisonous spiders in your area. Even though spiders catch and eat bugs and insects in your home, there are better ways at removing flying pests from the home naturally. Despite the harmless nature of most spiders and the benefit to the environment, getting rid of spiders as quickly as possible is usually the only choice for many people. Here are 2 reasons to eliminate spiders from your home. You don’t have to be a complete arachnophobe to want to kill off spiders from you home. A large spider quickly running across the floor is enough to elicit a scream or terror in many people. Certain species of spiders are poisonous and can give you a nasty bite. Some of the most common poisonous spiders are the black widow spider and the brown recluse spider, and wolf spider. The bites from wolf spiders or brown recluse spiders are not as serious. They can leave you with a red, swollen, painful bump on your skin. Sometimes, ulcerous sores can develop where you were bitten and may take between 10 days and a month to heal. If you notice severe skin reactions after a spider bite, you should seek medical attention to reduce the risk of the infection getting worse. Many natural ingredients have insect and spider repellent properties. These natural sprays can be used directly on a spider as a natural insecticide. Or, some spider sprays can be used around windows, doors, and other areas to repel spiders from entering the house. Many people have had success in getting rid of spiders using peppermint oil spider sprays mixed with other essential oils. Essential oils have chemicals that have a lethal effect on many insects, including arachnids. Also, the strong smell of peppermint oil, clove oil, and cinnamon oil repel spiders and other creepy crawlies. Fill a 16-oz. (470 ml) spray bottle with warm water almost to the top. Add 7-10 drops of peppermint essential oil (or, you can use a mixture of peppermint oil, clove oil, and cinnamon oil). Add a few drops of liquid dish soap and shake well to mix the ingredients. Spray the natural spider repellent on entry points around your home to help keep spiders out. Also, spray the peppermint oil solution in corners to help prevent spiders gathering there. Reapply the natural spider spray weekly to repel spiders and other bugs that might venture into your home. Another essential oil that can be used as the main ingredient in DIY spider sprays is lemon eucalyptus oil. Lemon eucalyptus oil is extracted from the leaves of lemon eucalyptus trees and has a strong potent smell that spiders and other insects don’t like. However, it is pleasant for humans and can help freshen up your room. In a spray bottle add 10 drops lemon eucalyptus oil to 16 fl oz. (470 ml) warm water. Add a few drops of liquid dish soap to help mix the oil and water and shake well. Use the natural spider spray around windows, doors, and other entry points to your home. Spray the areas 1-2 times a week to protect entry points and keep spiders out your home. You can also use a combination of eucalyptus essential oil and lemon essential oil, as citrus smells are believed to ward of spiders too. All you have to do is make the natural spider spray by adding 5 drops citronella (or lemon essential oil), 5 drops eucalyptus oil, and a little washing-up liquid to water in a spray bottle. Spray in areas where spiders may enter your house. The potent properties of neem oil and tea tree oil together combine to make a powerful anti-spider spray to use in your home. Neem oil has a smell that spiders detest and tea tree oil is a natural insecticide that destroys insects and their larvae. Fill a 16-oz. spray bottle with warm water and add a little dish soap. Add 1 oz. neem oil and 5 drops of tea tree oil. Spray the natural solution at all entry points to your home. Use in the garden around rocks, bushes, and the foundations of your home. If you see any live spiders, spray the killer spray directly on the spiders to kill them instantly. For example, install tight-fitting window screens and door sweeps to prevent spiders entering your home, thoroughly clean your house on a regular basis, clip back bushes from the side of the building and remove debris. Vacuuming is also a very effective and simple method to eradicate bed bugs from your bedroom, and is one of the top 10 home remedies to get rid of bed bugs naturally. One easy way to exterminate spiders that prefer living on the ground and spinning webs is to use glue traps. In fact, when trying to get rid of lizards with glue traps and other pests in the house, you will undoubtedly catch a few spiders on the board. You should place the glue board under furniture, under beds, and other hard to reach areas. If you have a large problem of spiders in your home, you will find spiders stuck to the glue traps in no time at all. Just make sure to keep the glue boards out of reach and away from pets and children. If you need to get rid of a spider infestation from your house, attic, garage, or barn, you can use diatomaceous earth. DE is a naturally occurring product from the fossilized remains of a type of algae. Food grade diatomaceous earth is also non-toxic to humans and pets and can be safely used in all areas of the home for insect control. Lightly sprinkle food grade diatomaceous earth in areas of the house where spiders spend most of their time. Check the treated areas every few days to make sure that the powder hasn’t become damp or moist. If so, dry the area and reapply. You can also use diatomaceous earth to kill fleas, get rid of a bed bug infestation, and it can even be used as a natural treatment for intestinal parasites. There are some other ways of eradicating spiders from the home that many people say are effective. Although there is no scientific evidence to back up these natural spider repellents, there is anecdotal evidence that they could be useful spider control methods. Horse chestnuts are said to have properties that repel spiders. Many people recommend placing horse chestnuts in corners of rooms or on windowsills to prevent spiders setting up home in your house. One of the ways that some people use baking soda around the home is as a spider repellent. Sprinkle baking soda around areas where you have seen spider activity. The smell should stop them from coming near the baking soda and they will find other places to live. Homemade tobacco spray. You can try making your own spider killing spray by soaking a packet of chewing tobacco in a gallon of boiling water. Leave it to cool and pour a cup of the tobacco solution in a spray bottle and add 1/2 cup lemon-scented dish soap. Spray onto spiders to zap them. Or, you could form the damp tobacco into balls and place on windows sills to stop spiders entering your home. Tomato leaf spray. Put a handful of tomato leaves in a blender and blend with 4 pints of water. Add a tablespoon of cornstarch, mix well and put into a spray bottle. Spray around areas where there has been spider activity. Garlic spider repellent spray. If you don’t mind the smell, put 3-4 cloves of garlic in a spray bottle, add water, and leave for a couple of hours to infuse. Spray around entry areas to your home to keep the crawling pests out. The sulfuric smell is repellent to spiders and should help to keep them out of your home. Spider repellent salt spray. Make a salt spray to kill spiders on contact. Just mix 1/2 oz. salt with 1/2 gallon of water. Mix it well to dissolve the salt. Fill a spray bottle with the salt solution and spray around doors and windows in your home. If you see a spider in the corner of your room or scurrying across the floor, spray the salt directly on it to kill it dead. Lemon juice or vinegar spray. Add 1/2 cup of lemon juice or white vinegar and 2 tbs. of chili powder or hot chili sauce to 1 qt. (1 l) of water and shake until the ingredients are well mixed. Pour the mixture into a spray bottle to create a natural spider repellent spray. Keep outdoor lights off at night to avoid attracting spiders and other bugs near your home. Carefully examine the exterior of your home and fill up tiny cracks and crevices where spiders can enter the home or set up egg nests. Remove as many insects as possible from your home like ants, flies, and other bugs that spiders love to feed on. Don’t plant vegetation too close to your home as vegetation attracts spiders. EntomologyUKY. Eliminating spiders around homes and buildings. PSU. Why are so many people afraid of spiders. Int J Drug Dev Res. Essential oil repellents. UGA. Integrated pest management tactics in the suburban landscape. TAMU. Insects in the city. You talk about using diatomaceous earth but didn’t mention any cautions about using it. It is very dangerous to breath it in, especially on over repeated times. It is a very fine powder and is inhaled very easily. It is dangerous to the lungs and can cause cancer over time. The particles are small but also sharp and can cut into the membrane lining. It isn’t safe to use around the house where it can be breathed in by humans or pets. Use only in well ventilated areas.